It’s not just an art gallery, it’s an artistic space-time journey! I finished two sculptures for my gallery today, and drove them out. The gallery is about 45 minutes away in Spring Green, so gallery trips (which I only make a few times each year) are little meditative getaways for me. Highway 14 takes me west of Madison through pleasant smaller towns like Cross Plains, Black Earth, Mazomanie and Arena, birthplace of one of my favorite beers (Lake Louie Warped Speed scotch ale). 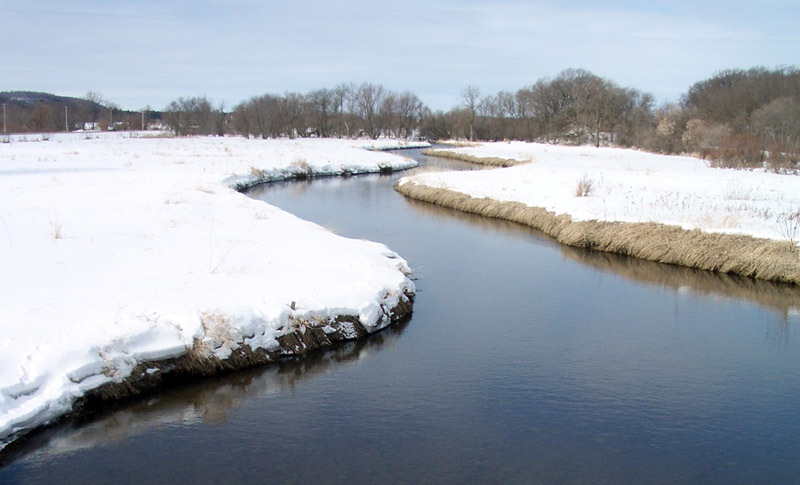 Various waterways wend their way on either side of the highway, including Black Earth Creek and part of the Wisconsin River watershed. Stony Creek, off Hwy 14 West on the way to Spring Green. Spring Green is a smallish town with a nonetheless healthy tourist trade, driven partly by its proximity to nationally-known features such as the American Players Theater and Frank Lloyd Wright properties including House on the Rock. 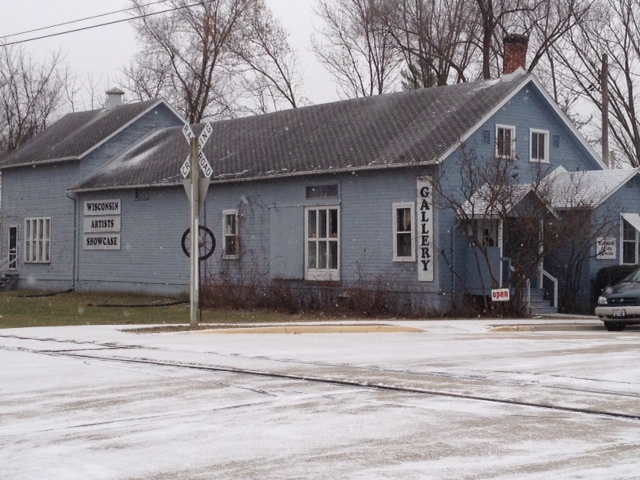 The Jura Silverman Gallery in Spring Green. I’ve been at the Jura Silverman Gallery since 1995. I’ve periodically been at other galleries in Madison, Verona and Algoma, but Silverman is the only one that’s been constant. I wasn’t even out of college when Jura agreed to represent my work, and I was lucky to benefit from her business savvy. Because of her, I “balance test” all my sculptures to ensure they aren’t too easily knocked off-base by gentle bumps they might receive in a typical home. I also know that some people who purchase my work will visit it repeatedly, sometimes for more than a year, before making the purchase. I also know that blue tends to sell better than other colors amongst the gallery’s patrons. My last 2 sales, in July, had blue flowers and Jura asked that any new pieces I bring also have blue. 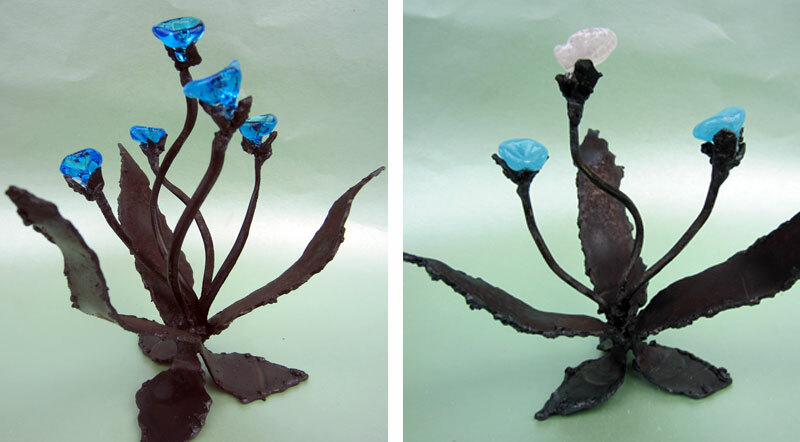 Two new glass flowered welded steel sculptures made for selling at the Silverman Gallery. The gallery is just one outlet for my work — I sell more in volume via friends/acquaintances, etsy and art shows — but it’s an important part of the professional artist’s identity. I scouted and courted Jura for placement of my work in her gallery while I was still earning my MFA, and felt very lucky to be accepted. Sometimes it’s surprising for me to see pieces of mine that have been “living” at the gallery for awhile – it makes me reflect on the evolution of my work. I wonder what I’ll be thinking and making in the future? 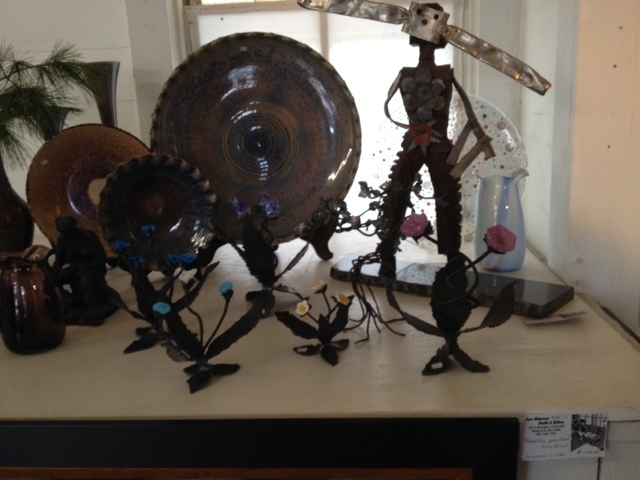 My work at the Silverman Gallery: 6 flowered metal plants / trees in foreground.